The period opened with the 40th Tank Battalion in assembly area in EUPEN, BELGIUM, under command of Combat Command Reserve, Seventh Armored Division. Training, maintenance and physical examinations were conducted for all personnel. At 030920 FEBRUARY 1945, the Battalion was placed on a four hour alert for movement status. Preparations for movement were completed and the Battalion Commander and Company Commanders went on a personal reconnaissance of the area WITZERATH (992248) - KESTERNICH (004240), GERMANY where the pending operations were to take place. 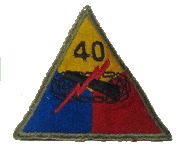 B/40 was attached to the 3rd Battalion, 310th Infantry Regiment under command Combat Command Reserve, 7tha Armored Division for the Operation and moved out 041030 FEBRUARY 1945 from EUPEN, BELGIUM to assembly area SIMMERATH, GERMANY (985241). A detailed account of B Company's operations appears in PART II below. C/40 was attached to the 38th Armored Infantry Battalion, 7th Armored Division under the command of Combat Command Reserve, 7th Armored Division for the operation and moved out 042200 FEBRUARY 1945 from EUPEN, BELGIUM to assembly area SIMMERATH, GERMANY (985241). A detailed account of C Company's operations appears in PART II below. The Assault Gun Platoon from position (990248) NE of SIMMERATH, and the Mortar Platoon from position (993264) SW of ROLLESBROICH, GERMANY supported the attack of Task Forces LUTZ and MC DANIELS initially but were not further needed because of the light enemy resistance. Both platoons were pulled back into the Battalion assembly area. The 40th Tank Battalion less B and C Companies and with the troops shown below attached, composed Task Force BROWN and Combat Command Reserve. Task Force BROWN began movement from EUPEN 050400 FEBRUARY 1945 to assembly area IMGENBROICH, GERMANY (957206) in Combat Command Reserve closing 0655. See PART II for actions B/40 5-6 FEBRUARY and C/40 5-12 FEBRUARY 1945. On 5 FEBRUARY 1945 Task Force BROWN moved to assembly area in SIMMERATH, GERMANY. Attached troops were employed on order CO, Combat Command Reserve which ultimately depleted Task Force BROWN to the 40th Tank Battalion less B and C Companies. B Company rejoined the Battalion on the afternoon of 12 February 1945. At this time it was thought that Combat Command Reserve would move back to EUPEN, BELGIUM to rejoin the remainder of the 7th Armored Division in that area but the condition of the roads after the thaw, were such that unnecessary movement was forbidden. The Battalion remained in SIMMERATH, GERMANY throughout the remainder of February 1945. On 8 and 9 FEBRUARY 1945 the tank dozers of B and C Company worked with the 78th Infantry Division in clearing mines in the vicinity of SCHMIDT, GERMANY. While on this mission, one tank received a direct hit by either mortar or artillery seriously wounding one officer from B Company and slightly injuring one man from C Company. This occurred while the two tanks were in SCHMIDT. On 12 FEBRUARY 1945 orders were received to organize a work detail of 300 men plus officers and drivers and necessary vehicles for doing engineer work on the roads in the vicinity of MALMEDY, BELGIUM under the supervision of the 164th Combat Engineer Battalion. This detail departed on the afternoon of 12 FEBRUARY 1945 for MALMEDY and began work in that vicinity 13 FEBRUARY 1945. The detail was later reduced to 260 men plus officers and drivers and moved back to SIMMERATH so as to be closer to the road work which was along the IMGENBROICH (957206) - KALTERHERBURG (926147) highway. The work was completed and the detail was released at the completion of work on 28 FEBRUARY 1945. During this period the white wash snow camouflage was removed from all vehicles; first and second echelon maintenance was conducted; summerfeld wire matting for holding natural camouflage was welded on all tanks; steel rails were welded around the rear decks of all medium tanks for riding infantry; training was conducted on basic subjects; reconnaissance was made of probable areas of operations; equipment was restowed on all vehicles; and rest and rehabilitation of all personnel. On 16-17 FEBRUARY 1945 The Battalion staff participated in a CPX conducted by Division. The exercise was over terrain between the ROER and RHINE RIVERS. The two tanks lost to mines were replaced and three 105MM Assault tanks were exchanged for the M4A3E8 105mm Assault Gun. Prior to this time two 76mm M4A3E8 tanks had been received by the Battalion. At the close of the period the Battalion was at full strength on all vehicles except one light tank was authorized as a tank retriever. B Company, 40th Tank Battalion was attached to the 3rd Battalion 310th Infantry Regiment (78th Infantry Division) under command of Combat Command Reserve, 7th Armored Division. The Company moved from assembly area SIMMERATH, GERMANY to attack position KESTERNICH, GERMANY (005240) 050715 FEBRUARY 1945 as part of Task Force LUTZ. Mission of Task Force LUTZ - To secure ground (first objective) (013255) initially and support by fire the attack of the force on the left to secure STRAUGH, GERMANY (011260); thence to seize and secure STECKENBORN, GERMANY (023263) (2nd objective). Plan of attack - two infantry companies abreast both closely supported by B/40 under direct command CO B/40. To be cross country directly to objective #1 and #2 because the road from KESTERNICH to STECKENBORN goes through STRAUCH which was also under attack by another force and because the roads were all heavily mined and in places blocked by snowdrifts. The attack was launched at 0700 and the first objective (ground at 013255) was taken without opposition except for extensive minefields encountered immediately outside KESTERNICH. Most of the mines were layed on top of the ground and were uncovered by the melting snow. Task Force MC DANIELS on the left succeeded in moving into STRAUCH with very little opposition as Task Force LUTZ was ordered by CO, Combat Command Reserve to proceed to STECKENBORN the second objective. STECKENBORN was taken against light opposition, approximately 35 prisoners being taken in the operation. On the eastern outskirts of STECKENBORN, is a line of "Dragons Teeth" anti-tank obstacles covered by numerous pill boxes on the commanding ground beyond the line. Most of the pillboxes were manned. However, the enemy offered only a token resistance when attacked and surrendered readily when fired on by the tanks and 90MM Tank Destroyers. Extensive mine fields were again encountered here and one tank was lost to mines. No personnel casualties were suffered. At the end of the day, the first and second objectives had been taken and the Siegfried Line defenses in the vicinity had been reduced. Approximately 75 prisoners were captured in the operation. On the morning of 6 FEBRUARY 1945, the 2nda Platoon of B Company supported the infantry in an attack to secure HECHELSCHEID (035271) beyond the Siegfried defenses breached the previous day. Enemy troops occupied the town but surrendered immediately as the force moved into the town. Approximately 40 more prisoners were taken by the force. At 061200 FEBRUARY 1945, B Company was relieved from attached to the 3rd Battalion of the 310th Infantry Regiment and reverted to control of the 40th Tank Battalion in SIMMERATH, GERMANY. C Company, 40th Tank Battalion was attached to the 38th Armored Infantry Battalion (7th Armored Division) under command of Combat Command Reserve (7th Armored Division as part of Task Force MC DANIELS. Mission of Task Force MC DANIELS - To seize STRAUCH (011260), organize it defensively, prepare to assist attack of task Force LUTZ on STECKENBORN (024262). Plan of attack - two infantry companies abreast supported by C/40 under direct command CO C/40. The attack to be astride the main road from SIMMERATH TO STRAUCH. The attack started at 050700 FEBRUARY 1945 as Companies B and C, 38th Armored Infantry Battalion passed through elements of the 78th Infantry Division at WITZERATH, GERMANY (992248). Company C, 40th Tank Battalion moved in close support of the attacking infantry. Enemy resistance was negligible as he withdrew from the town to the pill boxes on the commanding ground NE of town. The enemy once again had placed extensive minefields on top of the ground but they were uncovered by the melting snow. One tank was lost to mines with no loss of personnel. On the eastern edge of STRAUCH is a line of "Dragons Teeth" anti-tank obstacles covered by numerous pill boxes. Here is where the enemy elected to fight. After STRAUCH was taken, the first platoon, C/40 under command of Second Lieutenant ROBERT M. SCHULTZ, moved into firing position astride the STRAUCH - SCHMIDT road and engaged two pill-boxes at a range of 800 yards. Concentrated fire of the platoon drove eight or ten of the occupants of the smaller pill-boxes to a larger pill-box to the rear. The gunner from the Company Commander's Tank fired two rounds from his 76MM gun through the embrasure of the large pill-box and destroyed a 75MM anti-tank gun inside the pillbox causing the surrender of 17 occupants, killing two and wounding two. This is the first time an anti-tank gun has been encountered by this unit inside pill-box of the Siegfried Defenses. At 1630 1st Lt JAMES L. SPARING with two tanks and an infantry Platoon moved out astride the STRAUCH-SCHMIDT highway to gain contact with friendly elements of the 78th Infantry Division on the left. This small force captured two more occupied pill-boxes and 18 prisoners before being stopped by anti-tank fire. After being stopped here, Task Force MC DANIELS took up defensive positions for the night. These positions were maintained until 8 FEBRUARY 1945 WHEN C/40 was assembled in Task Force Reserve in STECKENBORN. On 10 FEBRUARY 1945 a reconnaissance by fire across the ROER LAKE was conducted by one tank platoon but it failed to draw a reply from suspected enemy positions. The platoon was withdrawn to STECKENBORN before dark. On 12 FEBRUARY 1945 C/40 was relieved from attached to the 38th Armored Infantry Battalion and reverted to control of 40th Tank Battalion in SIMMERATH, GERMANY. During the month of FEBRUARY, the 40th Tank Battalion participated in only one operation - the operation that resulted in the capture 5-6 FEBRUARY of the German towns of STRAUCH, STECKENBORN and HECHELSCHEID, all situated in the middle of the Siegfried Line Defense. Although the enemy strength in these towns was approximately 200 men and he occupied positions from which it would have been difficult to dislodge him, he did not have the desire to fight but was willing to surrender after a token resistance. Approximately 185 prisoners were taken in all the operation. During this operation a total of two tanks was lost to mines with no personnel casualties. Three casualties were suffered by the Battalion during the month as a result of enemy action; one officer was seriously wounded and one man slightly wounded when a tank dozer received a direct hit by artillery or mortar while on a mine clearing detail in SCHMIDT, GERMANY; one man killed by a mine explosion in the billeting area in SIMMERATH, GERMANY. After the operation of 5-6 FEBRUARY 1945 the Battalion was primarily engaged in engineer work on the roads within the area.